Figure 4. Chromosome number and DOG1 gene analysis of the Lepidium papillosum genome. A, DAPI-stained mitotic chromosome spreads from flower bud tissue exhibiting 2n = 48 chromosomes. For better counting, chromosomes are labeled by small white crosses in the bottom image. B, Southern analysis of L. papillosum genomic DNA (Lepa gDNA) digested with EcoRI or XbaI and hybridised with a 0.35 kb LesaDOG1 Exon 1 probe shows the presence of 3 to 5 hybridizing bands indicative for LepaDOG1 genes. 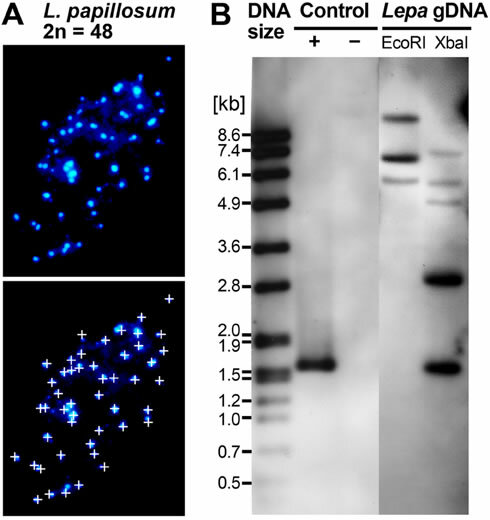 Note that neither LesaDOG1, nor the cloned genomic LepaDOG1 fragments (Supplemental Table S1) contain EcoRI or XbaI restriction sites within the region covered by the Southern probe. Hybridization controls (CON) are plasmids with (+) or without (-) LesaDOG1 full-length genomic DNA inserts; left lane: DNA molecular mass ladder.